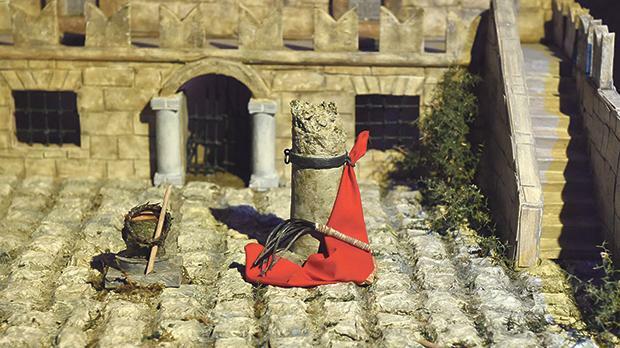 Detail of part of the model of Jerusalem, showing the pillar upon which Jesus was scourged. For Holy Week the group of altar boys of the Dingli parish have set up an exhibition entitled Loved Till The End in St Mary Magdalen chapel, perched on Dingli Cliffs. The exhibition consists of a model of the old city of Jerusalem where Jesus instituted the Eucharist during the Last Supper and laid down his life on the cross. The model, which measures 180 x 240cm, depicts the prominent places in the passion of Christ. The exhibition is accompanied by an animated narration of the story of Jesus’s life, passion, death and resurrection. The wayside chapel dedicated to St Mary Magdalene was rebuilt in 1646 on the site of an earlier chapel dating back to the 15th century. The small chapel, which forms part of Dingli parish, was recently restored to its original state. Fire torches will be lit up outside the chapel in the evening on Maundy Thursday. The exhibition will be open to the public today and tomorrow from 9am to 7pm; on Maundy Thursday from 9am to 3pm and from 8pm to midnight; and on Good Friday and Holy Saturday from 9.30am to noon.